Peaches & Peaches: We Love: Granola! I'm just going to put it out there: I love breakfast. And as I scroll through my Instagram munching on said breakfast, I know I'm not the only one. My favorite breakfast has long consisted out of fruit, yoghurt and some diet cereal. But along the road I learned that these store-bought cereals contain a ridiculous amount of sugar, even the diet ones! But I really like the crunch it gives to my breakfast so I was happy as a hippo when granola became popular and came across my radar. An easy and healthy cereal recipe really sounds like music in my ears. I've been making this pot of gold for over a year now so I thought I'd share this with you. It's nothing new, you can find a million similar recipes on Pinterest, but this is my humble version with some tips and tricks. Preheat your oven to 180°C (I always forget this step) and choose your favorite grains. I always choose whole grains and this time I made a combination of spelt, buckwheat and regular oats. You can find the regular oats in any local supermarket nowadays. The more "special" ones I buy in a health food store. I use a total of 150gr of grains which doesn't seem alot, but I don't want to "overcrowd" my baking tray later on. 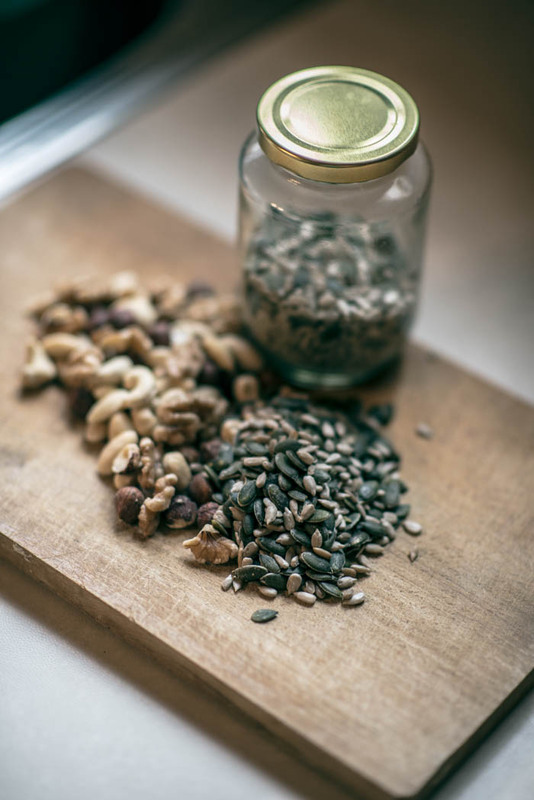 Choose your favorite nuts and seeds. I went for a nut mix and pumpkin and sunflower seeds. I put a number on the amount in the ingredient list, but just add to your liking. I did try to chop up the nuts a bit but it's not necessary. As you can see, the hazelnuts would'nt listen anyway, like they're immune to knives (chopping them in half first probably would have helped). Add a pinch of salt and some cinnamon to liking. 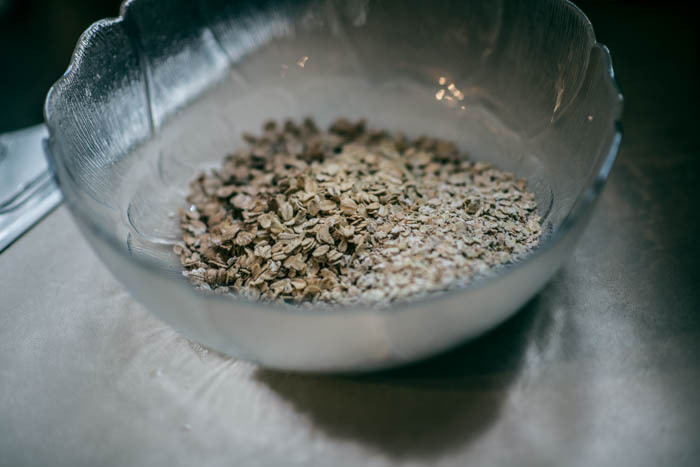 I have to admit I actually forgot the salt and cinnamon this time and I can assure you the salt gives that little extra dimension to an already awesome granola. I use himalaya salt 'cause it's supposed to contain more minerals and it's pink. Our dutch speaking readers can read a funny article about himalaya salt here. Add a tablespoon of coconut oil and two tablespoons of maple syrup. I've used olive oil in the past, but I like coconut oil better. I've read somewhere you should avoid oils high in omega-3 fats as they go rancid when heated. 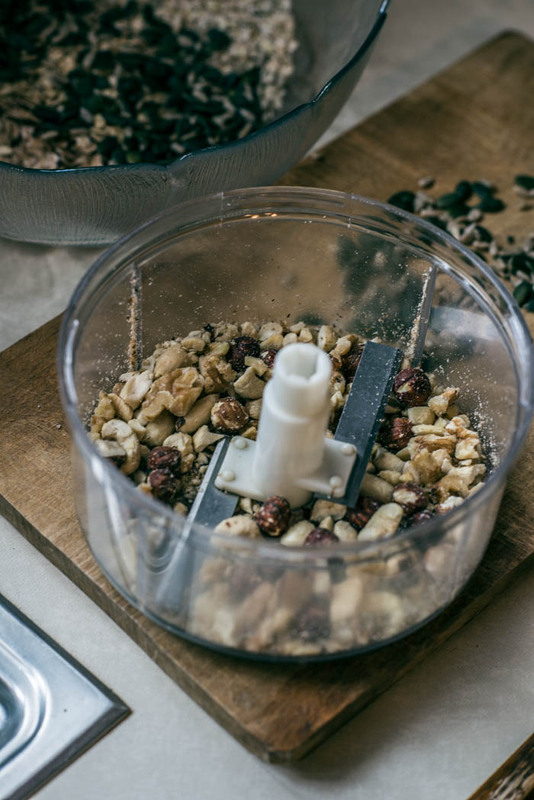 So make sure to check that before sprinkling your oil over your granola. Mix it up! I use my hands to make sure my whole mixture is covered in oil and syrup. It's nasty but it works! 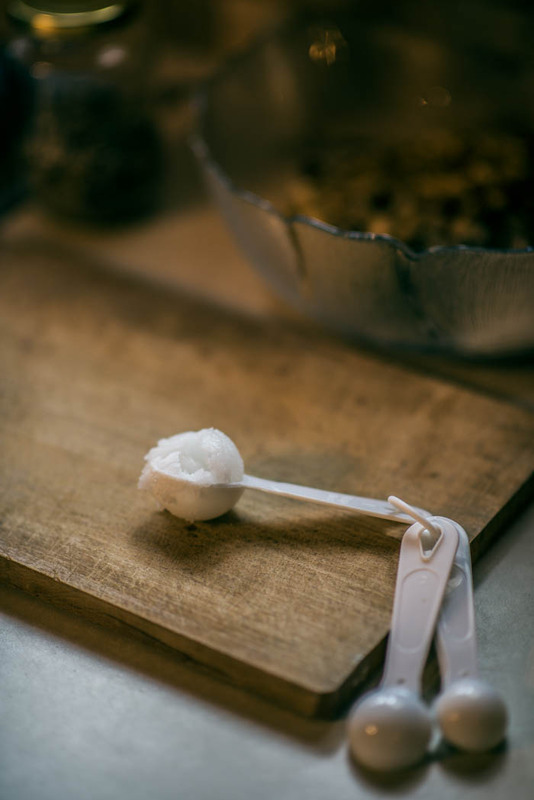 The heat of your hands will also make the coconut oil go soft so it's easier to get everything covered evenly. Do make sure to wash your hands before...hand. And afterwards. 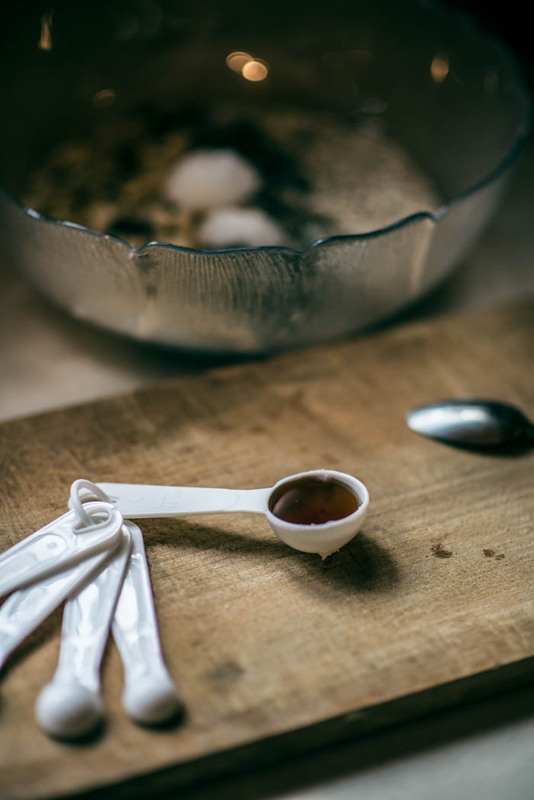 Cover a baking tray with baking paper and spread your mixture onto the tray. 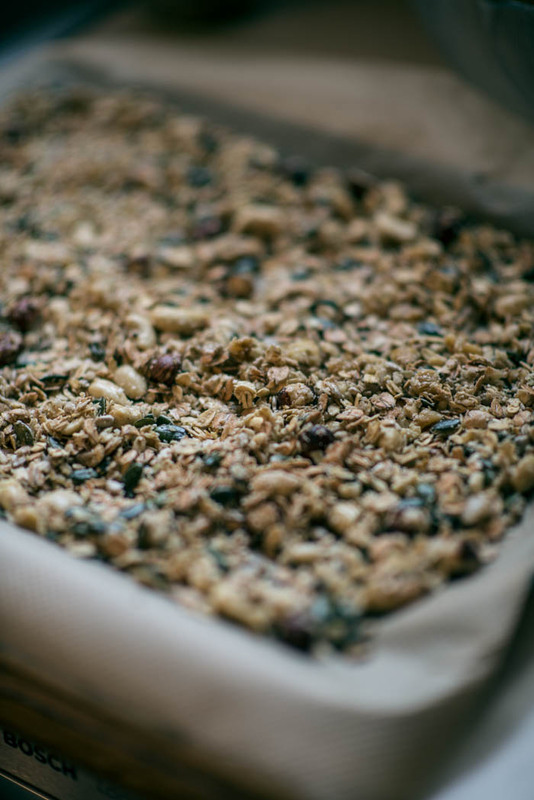 I've learned from experience that it should be a thin layer to ease the baking process and to get that crispy granola everyone has dreamed about. Bake for aproximately ten minutes (until golden brown) and let it cool. 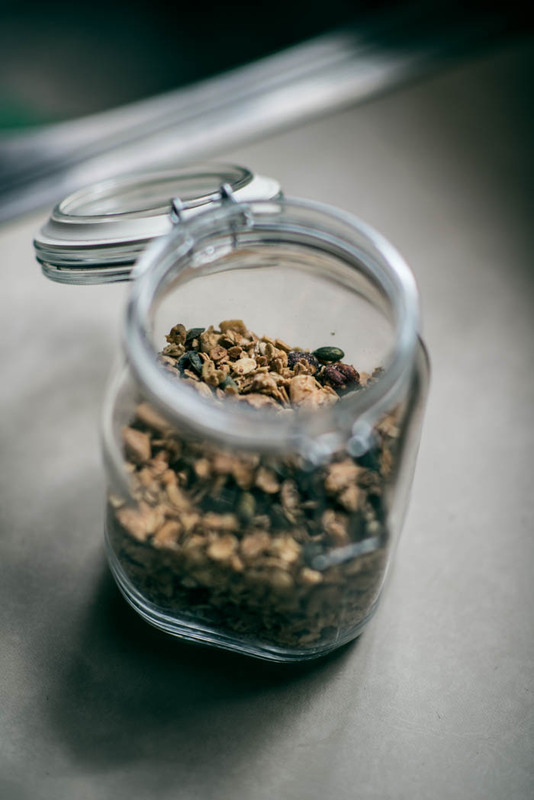 Go get yourself a mason jar and when completely cooled, pour your awesome granola in the jar. The baking paper is a life hack which makes pouring more easy, it's not really needed for anything else as most baking trays are non-sticking anyway. Tadaa! This amount is enough for about ten portions of granola. I eat 30 grams per portion, mixed with fruit (kiwi is my new favorite) and plain non-sweetened yoghurt. Bon appétit! We Wear: Lies en Oreye.